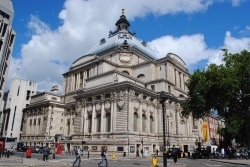 It’s 53 years ago this month that the World Cup trophy – offiicially known as the Jules Rimet Trophy – was stolen from Methodist Central Hall in Westminster (OK, it’s not a very round figure, but it’s a fascinating story). The trophy had arrived in the UK in January for the tournament to be held later that year and was mostly kept at FA headquarters at Wembley. But in March, it went on show at a stamp exhibition being held at the hall (pictured). Despite being kept under (relatively) constant guard in a glass cabinet, the trophy was discovered missing just after 12pm on 20th March (the crime had apparently occurred while the guards were on a break). Scotland Yard immediately set about investigating the theft but to no avail (the FA, meanwhile, secretly commissioned a replica to be made, just in case the trophy couldn’t be recovered). A couple of days later Joe Mears, chairman of the FA, received an anonymous package. It contained the removable top lining of the trophy and a demand for £15,000 in return for the trophy. An exchange was to be set up involving codes placed in newspaper personal ads. The FA chairman then worked with Scotland Yard to set up a false exchange. On 24th March, Flying Squad Detective Inspector Leonard Buggy, posing as Mears, met a former soldier who turned out to be Edward Betchley in Battersea Park, showing him a briefcase filled with newspapers covered with a layer of £5 notes. Betchley then accompanied Buggy in a car, ostensibly driving to pick up the trophy, but he got spooked along the way and jumped out. Betchley was arrested minutes later but refused to reveal the trophy’s whereabouts, claiming he was just the middleman come to collect the ransom (he was later convicted of demanding money with menaces with the intent to steal). The trophy was actually discovered a week after it was stolen by a collie-cross named Pickles who found it lying near a neighbour’s car outside the Norwood home of his owner, Thames lighterman David Corbett. Pickles – who went on to become something of a celebrity in his own right appearing in TV shows and even a film, The Spy with a Cold Nose – has, of course, since died (his collar is on display in the National Football Museum in Manchester). The crime has never been officially solved although there were claims last year that late London gangster Sidney Cugullere and his brother Reg were behind it. England, meanwhile, did go on to beat West Germany 4-2 in the World Cup final that year. Life, meanwhile, didn’t turn out so well for the trophy. It was stolen again in 1983 in Brazil and this time was not recovered.